2 Samuel 1:21 (KJV); Ye mountains of Gilboa, let there be no dew, neither let there be rain, upon you, nor fields of offerings: for there the shield of the mighty is vilely cast away, the shield of Saul, as though he had not been anointed with oil. (2 Samuel 1:14). He understood its intrinsic worth, highly respected and honoured it. In this, David teaches us that there is surely a way that an anointed man is not supposed to end! There are things that should never happen to you because you are anointed of God. Child of God, the oil is so precious and what it does to the life of a man is invaluable. The Bible reveals that his head was cut off and paraded through the Philistine cities and his body tied to a tree (1 Samuel 31). That is not your story! 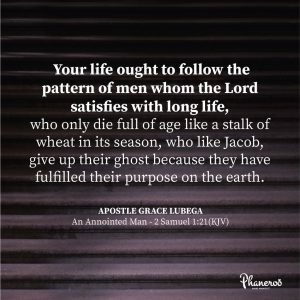 Your life ought to follow the pattern of men whom the Lord satisfies with long life, who only die full of age like a stalk of wheat in its season; who like Jacob, give up their ghost because they have fulfilled their purpose on the earth. Hallelujah! Your life ought to follow the pattern of men whom the Lord satisfies with long life, who only die full of age like a stalk of wheat in its season, who like Jacob, give up their ghost because they have fulfilled their purpose on the earth. PRAYER: Father God, thank you for the anointing! It preserves me and has set me apart as one marked and crowned by God for greatness. This same anointing breaks yokes and by it, my Lord went about doing good. Everything in my life is a reflection of this anointing: My walk, speech, attitude and every achievement. By it, I will finish well. Men will say that my end was of God. In Jesus’ name. Amen.